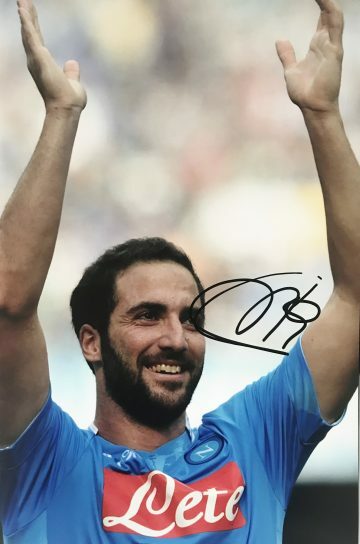 Shop our Napoli FC signed memorabilia including signed SSC Napoli shirts, balls, boots and mounted autographed player photo displays. All items come with free UK delivery and worldwide shipping and many with an actual photo of the player signing! As one of Italy’s best-known and most widely supported clubs, SSC Napoli is recognised all over the world as a footballing institution. Founded in 1904 by an English sailor, it was originally the Naples Football and Cricket Club before gaining independence and changing its name to Associazione Calcio Napoli in 1926. Napoli FC is now known as one of Italy’s most popular football clubs – but the road to success hasn’t always been smooth. There have undeniably been ups and downs throughout their history – but the high points undoubtedly outweigh the low points. They are now the fifth most valuable football club in Serie A, an accolade that has been mirrored on Forbes’ ‘Most Valuable Football Clubs’. They also have the fourth biggest fan base in Italy. In 2016 UEFA ranked Napoli the eighth best club in European Football and the second best club in Italy. When you take a glance at Napoli’s long list of achievements the reason for the numerous accolades becomes clear. They’ve won Serie A twice and finished as runners-up six times. They also triumphed 5 times at the Coppa Italia and twice at the Supercoppa Italiana. On the European stage, they have also excelled, winning the UEFA Cup in 1989. At his peak Argentinian legend Diego Maradona played for Napoli and propelled them to a spectacular league win – a huge achievement at the time since the club were relatively low profile. Search for and buy authentic SSC Napoli signed memorabilia here at Firma Stella. Our diverse collections feature a variety of special items sourced from major points throughout the club’s illustrious history. Browse now to shop football boots, signed Napoli shirts and signed Napoli footballs autographed by players.